Bharatiya Janata Party (BJP), the main opposition party, lashed out at Obama’s remarks. “If Obama wants FDI in retail and India does not want, then it won’t come just because he is demanding it,” snapped BJP leader Yashwant Sinha. BJP’s vice-president Mukhtar Abbas Naqvi was even harsher, terming Obama’s comments ‘laughable’. “That country (US) is giving us a certificate on investment and economy when it itself is facing economic problems… it is laughable,” Naqvi said. Equally sharp was the reaction of the Communist Party of India (Marxist) or CPI-M. “They want to open up our economy and market on their terms. They are creating this pressure for this purpose,” said CPI-M leader Nilotpal Basu. The timing of Obama’s comments is notable. Prime Minister Manmohan Singh recently assumed the additional charge of the finance minister following the resignation of former finance minister Pranab Mukherjee, who is now contesting to become India’s President. With Singh in charge of the economy, there are widespread expectations that he will unleash the long-pending reform process. 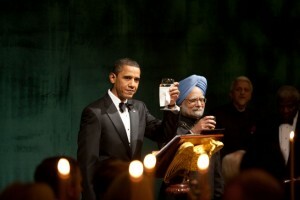 Interestingly, Obama described Manmohan Singh as a “friend and partner with whom I have worked closely”. Will Singh listen to his friend-partner?